The nation's largest senior living referral service has released detailed findings from its Senior Living Preferences Survey that reveal a number of surprising trends in senior housing and care, including the preference to live in walkable neighborhoods, a trend more often ascribed to millennials. 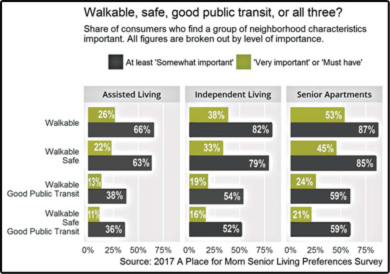 The study by A Place for Mom, shows for the first time not only walkability preferences, but how those preferences vary by senior care needs, senior living budget, financial resources and age. The study also provides deeper insight into other senior housing and care consumer preferences, including top priorities and various neighborhood characteristics. "The findings from this study are significant to not just seniors and their families, but to a broad audience who has the potential to shape future developments of senior living communities, neighborhoods and cities," says Charlie Severn, head of marketing. "The data can help inform local politicians and relevant stakeholders before making choices around zoning and the allocation of resources for public services." Walkability is not just for active seniors. Strong preference for walkability is most common among Generations 10 / Generation4Boomers.com Will 75 Million Baby Boomers' Desire for Walkability Impact City Planning? Data shows that seniors - even those who need assistance with mobility - want walkable neighborhoods, which could significantly affect community development and design senior apartment consumers (53%), but over a third of independent living consumers (38%) and over a quarter of assisted living consumers (26%) show a strong preference for walkability. Walkability is not just for city-slickers. Consumers in both urban and rural areas prefer walkable communities. To the extent that differences in preferences exist, walkability is most important to consumers who prefer urban centers. Yet more than half of consumers who prefer suburbs, as well as a third or more of consumers who want to live in a small town or rural area, also strongly prefer walkability. Regardless of care needs, the top three most important neighborhood features are low crime rate, close proximity to hospitals, and close proximity to family. Over 90 percent of consumers in each senior housing and care category prefer a neighborhood with low crime; same for proximity to a hospital. By 2020, nearly 56 million Americans will be age 65 or older and many of those older adults will be moving into senior housing and care. "The population is also physically aging more slowly, so many older adults will be able to stay more active later in life than past generations," says data scientist Ben Hanowell. "Across the spectrum of care needs, older adults will have a major impact on housing development over the next two decades. As a society, we need to start paying more attention to their behavior and preferences." Until now, little was known about the neighborhood preferences of senior living consumers, or how those preferences vary by age and senior care needs. 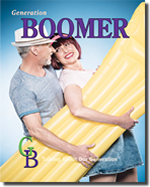 The study sheds new light on the topic, providing important context for urban developers as they develop future plans to accommodate all generations, including aging baby boomers. It presents an opportunity to develop sustainable, mixed-use, dense and multigenerational communities in America's rapidly growing cities and suburbs. 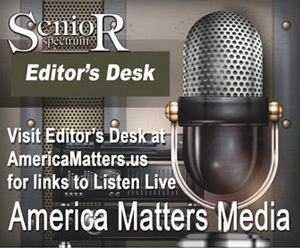 "There are obvious health benefits of walkable neighborhoods for seniors, but dense neighborhoods can benefit from the presence of seniors who can reduce traffic and the stress on local services," said Larry Gerber, founder of EPOCH Senior Living in Waltham, MA. "As more and more cities deal with the strains of rapid growth, they would be smart to consider creating housing and walkable communities that appeal to both seniors and millennials." A Portland State University and the National Association of REALTORS® study found millennials were almost two times more likely than baby boomers or the silent generation to find a walkable community "very important." Still, a sizable minority of older adults – 30 percent, or tens of millions of Americans – care about walkability. "It's time to abandon the idea that only millennials and Generation X care about walkability and the services available in dense urban neighborhoods," adds Severn. "These results show a growing set of senior housing consumers also find these neighborhoods desirable. It's a trend that should be top of mind among developers."